I try to save the biggest piece I can from each scrap, so I start at the top of the list and work my way down. If I cannot cut a ½-inch hexie out of a scrap, it goes in the bin. Unless it is a string. That is a whole other category of scrap. Like selvedges. 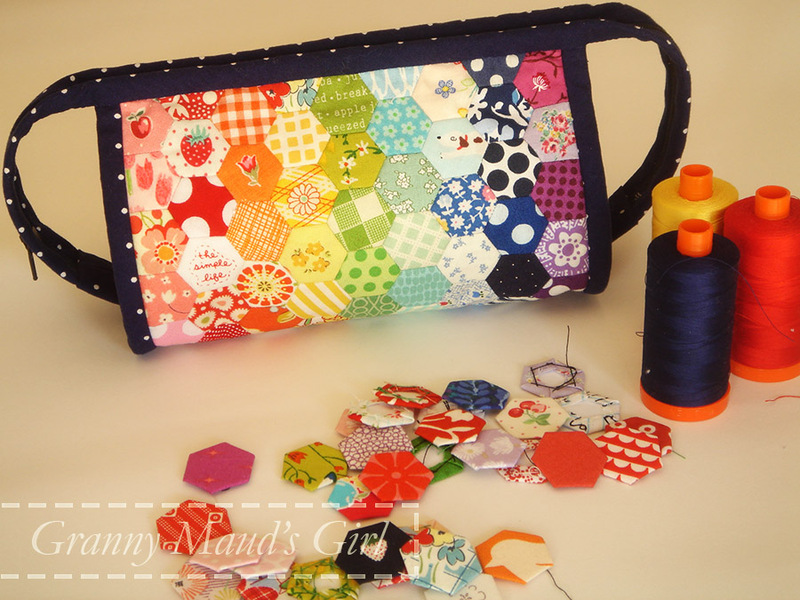 My pile of scrap ½-inch hexies was growing, so I decided to sew them into a rainbow. That is what happens when I have almost a fortnight without television or Internet. I did not have enough of some colours – especially purple, no surprise – so I cut more tiny hexies from my stash. 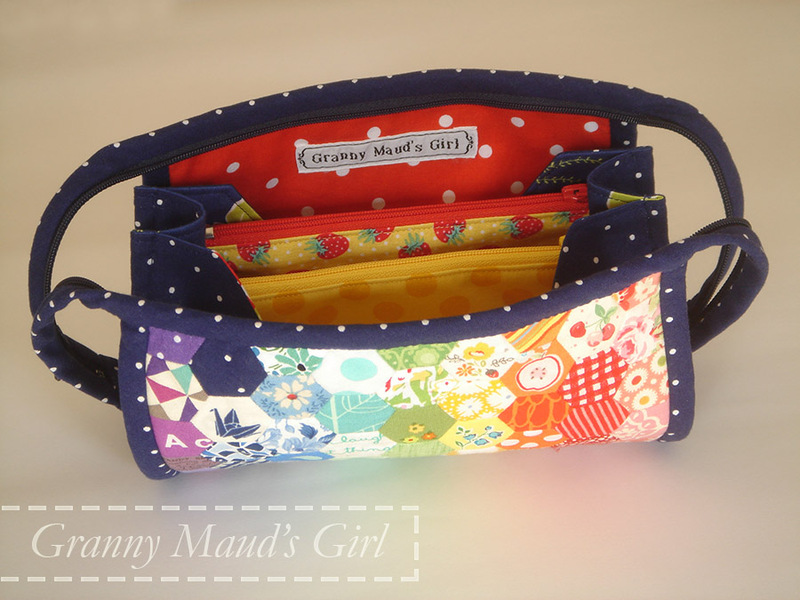 Then, I made a mini Sew Together bag by following Elizabeth’s modifications. Elizabeth, of Occasional Piece Quilt, explains how to adjust the original pattern to the cute-as-a-button smaller size. I overshared on Instagram, so you can see all the progress shots there. I placed the hexies in stripes of colour with the cutest ones near the ends so they would not end up on the bottom of the bag. I chose navy blue for the binding because I thought it would be almost neutral, allowing the hexies to shine. It might be a bit dark. Not sure. I had a couple of hiccups along the way: two broken needles (one machine needle and one hand sewing needle, both victims of the binding) and a desperate fight to save some fussy-cut cherries. I learned to measure the depth of the zipper pockets from the middle of B2 out and not from the zipper teeth down. As always, I referred to the Quilt Barn’s tutorial and used the zipper-end modification explained by Crazy Mom Quilts. If you want to make your own, you will need between 117 and 126 ½-inch hexies. I sewed 126 hexies, but I could have got away with 117 as I ended up cutting a ¼ inch off each end. I chose primary colours for the inside of the bag. I already have another daft tiny hexie project in progress. Yes, I am addicted. Now I have another little bag to carry my hexie projects about in. It’s a self-perpetuating process. 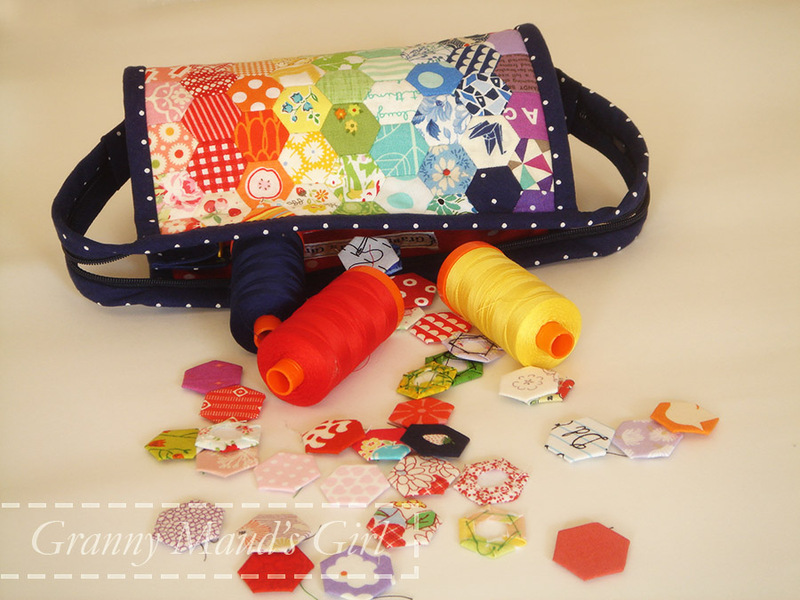 Make a bag, use it for hexies, make enough hexies, make a bag… And repeat. But extremely cute, and no, I don’t think the navy’s too dark, I think it’s just right. Oh so lovely. Told you hexies were addictive, hehehe. 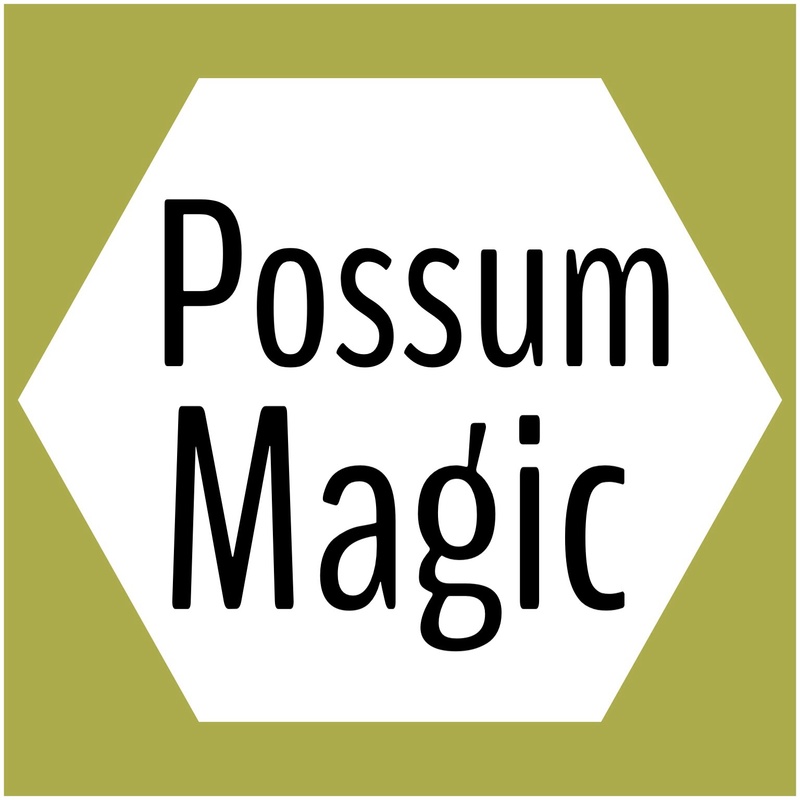 (as an aside,where doyou get your labels from?). I buy my labels from Cash’s. I think my mum used to buy my name labels from them too all those years ago when we had to label clothes for boarding school. Try here: http://www.nametapes.com.au. 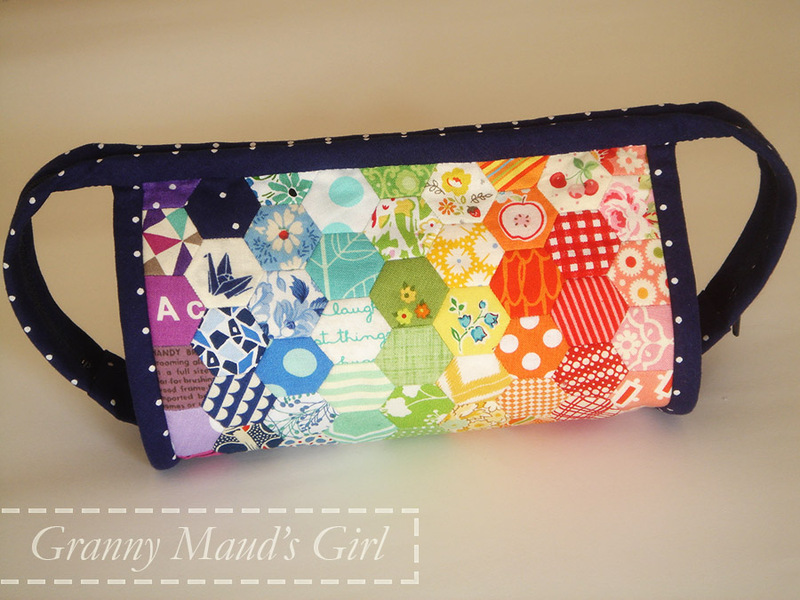 This is so cute, I love the rainbow effect and all from scraps. Seriously impressed. 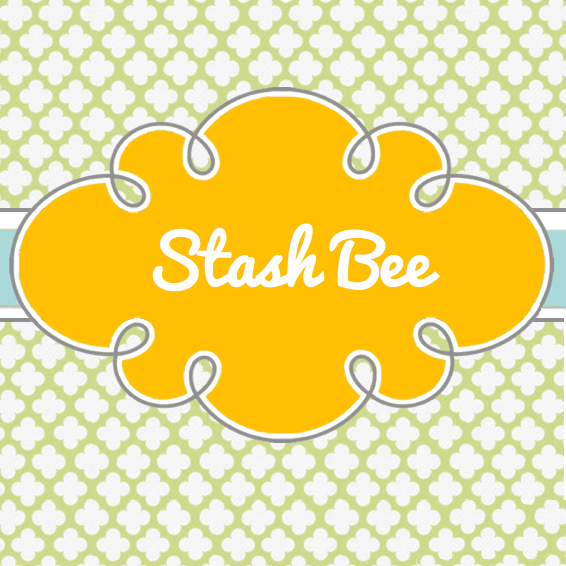 1/2″ hexies? Is that finished size or with seam allowance? Seriously tiny and impressive, anyway. And an absolutely lovely bag. The binding is perfect imo. Yes, Berte, the finished size of the hexies is ½ inch. Hexies are measured by the length of one edge, so the fabric needed for each is about a 1½-inch square. They are small, but I have seen and sewn smaller. Just beautiful. I think your scrap plan is a great idea. If only I could sew hexies as quickly as I think of designs for them! You know how much I love blue, so to me the navy is a great binding color. 🙂 I can see that it is darker than many of the prints, though, and maybe a white or light gray next time? I’m definitely curious what you’ll be making with those tiny hexies next. And yay for saving those cute cherries – they look great on the bag. You have a very creative mind! I love it! Those are the most darling little hexies! I would pull my hair out making them, but man, do I love to look at them. I really need to get on the ball and make one of those Sew Together bags for myself. Gorgeous! What a great idea. Love the rainbow effect. WOW! You are obsessed with saving little scraps aren’t you Carla! Anything smaller than a 2/5″ square goes in the bin at my place! Want them? Wow, that are tiny hexies. Love the bag! What a great bag! I have the pattern but have yet to try it! You. Are. An. Inspiration. Isn’t the Hexie craze amazingly?! 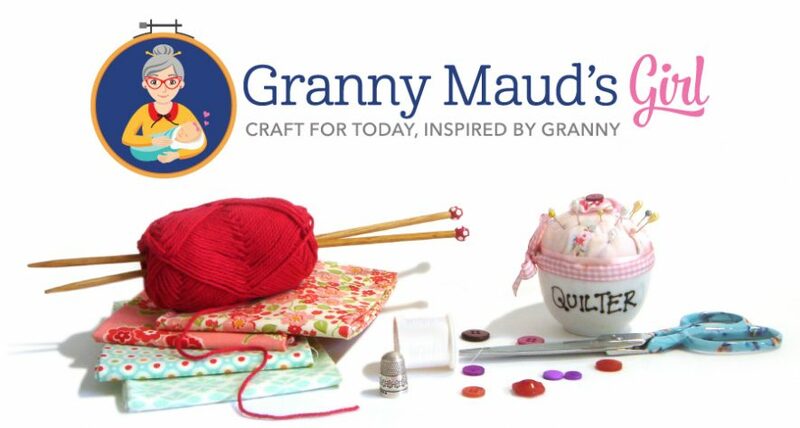 When I started making hexies about 16 years ago, people called me all the silly names : crazy, nuts etc. Well, I guess all of us got the crazies because they are still addicting after all these years. Enjoy every minute. I really thought I was going to have time to do hexies at my little shop, but nope. Too busy. That’s a good thing! 1/2 inch hexies????? I feel weak just thinking about that. Oh my. But such an awesome, vibrant bag. Great job! It is fabulous! Love it!